On 7 August 2016 the Minister of Agriculture and Food of Belarus Leanid Zayats announced that the country received $11m per day between January and June 2016 for exporting its agricultural products; this accounted for 18 per cent of all Belarusian exports. Moreover, according to national statistics Belarus has become the third largest world exporter of butter and powdered milk, as well as the fourth largest world exporter of cheese. At home, however, people are blaming authorities for high food prices. Experts point to high expenditures on agriculture, which exceeds income from export. Another problem is strong dependence on the Russian market – 85-98 per cent of Belarusian agricultural exports go to Russia. The risk of the Russian market partially closing also remain high. On 11 August 2016 Russian authorities once again banned export of certain Belarusian dairy products due to supposedly substandard quality. An engine for economic development? 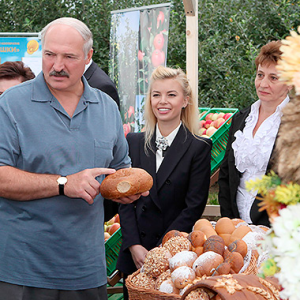 Agriculture has remained a priority for Aliaksandr Lukashenka throughout his presidency. Content analysis of his speeches reveals that the president time and again declares agriculture to be the driving force for economic development in Belarus. In August 2015 the Russian Minister of Agriculture Alexander Tkachiov claimed that Belarus, ​with a total market share of 86 per cent, had almost completely replaced the EU in import of dairy products to Russia. However, more detailed statistical data cast a shadow on the economic success of Belarusian agriculture. The table below depicts Belarusian export of the four most important agricultural products in 2013-2015. All calculations have been made by the author based on data from the National Statistical Committee of Belarus and National Bank of Belarus. These data prove some very important trends in Belarusian agricultural export. Firstly, they demonstrate its strong dependence on the Russian market. Russian authorities constantly accuse Belarus of dumping as well as exporting low-quality and​ / or re-exported agricultural products. Moreover, the deteriorating economic situation in Russia directly influences prices for Belarusian agricultural products. In 2015 they fell significantly compared to 2014. Preserving Belarus's status on the Russian agricultural market requires significant financial government allocations to agriculture. Even the authorities admit that they allocated more than $40bn for modernization of the agricultural sector. At the same time, the sector continues to offer some of the lowest salaries in the country – 66-72.25 per cent of the national average. About 35 per cent state agricultural enterprises remain unprofitable, while the total profitability amounts to 0.5-0.6 per cent. Unfortunately, such poor economic conditions are what allow Belarus to maintain its share on the Russian agricultural market. What's more, the Russian agency 'Rosselhoznadzor' and the Russian Prime-Minister Dmitry Medvedev have have accused Belarus of re-exporting EU agricultural products, prohibited in Russia. Some experts claim that around $2bn out of a total of $4-5bn gained from Belarusian agricultural export comes from re-exporting. Secondly, these figures confirm the existence of dumping. Prices inside Belarus can be twice as high as prices in Russia. This context makes exports to Russia seem much less profitable. Moreover, this situation contributes to high risks of devaluation of the national currency. The authorities unwittingly become interested in weakening the national currency in order to increase their profits from trade with Russia. The government tries to concentrate agricultural production in large state-owned farms. About 1,400 milk-producing farms produce 61.5 per cent of all dairy products. Nevertheless, authorities believe that state farms should be producing an even higher proportion of Belarusian dairy and blame private farms for the competition. The special government programme ‘Development of private farms in 2011-2015’ appeared to eliminate this competition while providing sources of cheap crude products either for further processing or direct export to Russia. However, the name of the programme should not deceive readers. It stipulates a decrease of food production by private farms and a state monopoly on buying such products. It also requires maintaining ridiculously low farm-gate prices. A story reported by numerous Belarusia mass-media, which occurred in May-June 2016, illustrates how this system works. Seven people from a village in the Haradok district of Vitsiebsk region near the Russian border sold their cattle to a Russian businessman instead of selling to the closest state agricultural enterprise. The latter would have offered much less and involved significant delays. As a result, the local authorities initiated an investigation and tried to bring these people to court, as well trying to confiscate money already paid. Many viewed Belarusian agriculture as an apparent success on the Russian market. The country has become one of the world's top dairy producers, as well as the main supplier of agricultural products to Russia. Russian sanctions against Western agricultural products facilitated this success significantly, making Belarusian products a real substitute for the banned supplies. However, this success comes at a high cost inside the country. Authorities allocate many resources to supporting this level of export. Extremely high domestic prices compensate for dumping in Russia. Poor economic conditions in the countryside, restrictions, unfair competition, and inefficiency of state-owned agricultural enterprises also contribute to this ‘success story’. Aliaksandr is Dean of the Faculty of Extended Education at the Belarusian State University of Culture and Arts, and expert of the NGO "The Liberal Club". On 27 July, the formation of Precinct Election Commissions (PECs) ended. PECs are responsible for conducting the vote count. In total 5,971 PECs were formed inside the country, plus another 47 abroad. On July 29, the Central Election Commission (CEC) published a list of PEC representatives and held a press conference. In total 65,856 representatives were included in PECs. Five hundred and fourteen opposition party representatives applied to serve on PECs. Only 53 (10.31 percent of the applicants) were approved to serve as commissioners. The PEC acceptance rate of those representing, what are generally known as, pro-governmental parties was significantly higher – 89 percent. Forty five percent of included PEC commissioners represent public associations, 37 percent are citizens who filed applications, 13 percent are from labour collectives and 5 percent represent political parties. Registered opposition parties recently held party congresses to nominate candidates for parliament. “Fair World” nominated 50 candidates, Belarusian Social-Democratic Party Gramada (BSDP-G) – 34, Belarus Popular Front (BPF) – 72, and United Civil Party (UCP) – 70 (32 of whom are members of the unregistered party Belarusian Christian Democrats who were nominated as part of a coalition agreement with UCP). Candidates from other forces such as “Tell the Truth” and Movement “For Freedom” are attempting to register their candidates through the signature collection process. The candidate nomination ended on August 1. Human rights observers noted the use of “administrative resources” to promote pro-governmental candidates in state-run media and to support their signature collection efforts. “Belarusian Association of Journalists” (BAJ) published a report on the coverage of parliamentary elections in 18 media outlets. The research reveals that state-run television gives much less airtime for coverage of the 2016 elections compared to other topics such as sports. On July 27, the formation of PECs for the 2016 parliamentary elections ended. In total 65,856 commissioners were included (out of 73,293 nominated). Opposition political parties nominated 514 people to PECs. 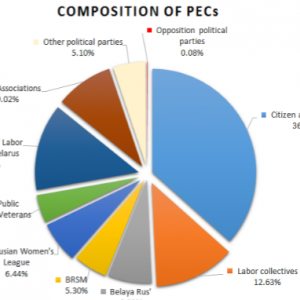 Only 53 opposition representatives (10.31 percent of nominees) were included in PECs. This constitutes 0.08 percent of the total number of PEC commissioners. According to CEC reports the rate of inclusion for pro-authority organisations (such as “Belaya Rus”) and pro-authority parties was considerably higher. The following chart based on CEC figures demonstrates the significant difference in inclusion rates between pro-government and opposition parties. PECs were formed during meetings of local executive committees and administrations. A PEC consists of between five and 19 commissioners. A new legislative amendment allowed international observers, representatives of political parties, and public associations to attend the PEC formation meetings. The amendment also required discussion of “professional and political qualities” of nominees at these meetings. Representatives of opposition political parties shared their impressions of PEC formation meetings. UCP hopeful Nikolay Kozlov (Starovilenskiy district #105) said that a large portion of nominated UCP representatives were not invited to PEC formation meetings. Local administration claimed these UCP members could not be reached over the phone. Another UCP activist from Mogilev informed candidates that PEC commissioners were approved without a discussion of their qualifications. “For Freedom” reported that none of its 21 nominated representatives to PECs in Kalinovskiy district #108 were approved. A similar situation was reported by representatives of the public association BPF “Adradzhenne”. It reported that only one of their 25 nominated representatives was included as a precinct commissioner in Oktyabrskiy district #16, with the local administration claiming that many BPF nominees did not have experience. “Right to Choose” reported that activists nominated to precinct commissions in Senetskiy district #76 from the labour union REP received calls from local officials, urging them to withdraw their PEC applications. Officially registered opposition political parties nominated candidates for parliament at their party congresses. The table below summarises the outcomes of opposition congresses. Unregistered opposition political parties/movements, “Tell the Truth” and “Movement For Freedom” sought to nominate their candidates through signature collection. “For Freedom” Deputy Chair Ales Logvinets organised a major signature collection event in Minsk coinciding with the anniversary of the adoption of Declaration of Sovereignty of Belarus on July 27. Logvinets invited Belarusian musician Lavon Volski to perform at the event. According to media estimates, the signature collection picket-concert was attended by over 1,500 people. Forces generally considered loyal to the authorities also held congresses to nominate their candidates (see the summary table below). The public association “Belaya Rus’” (which currently has 67 seats in the parliament) reported on its website about signature collection pickets in Minsk. In total, 443 initiative groups sought to nominate candidates through the signature collection process. One thousand signatures are required to nominate a candidate. 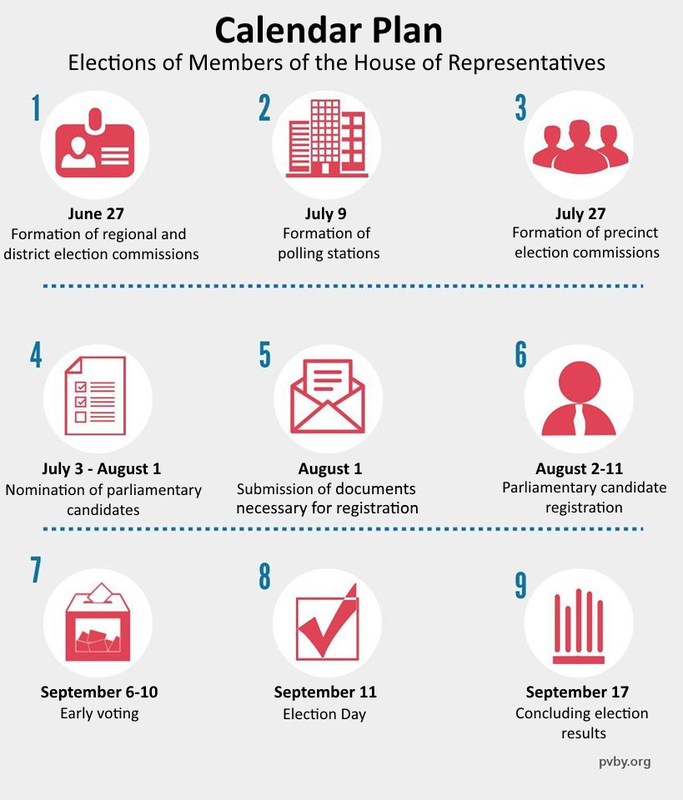 According to the parliamentary election calendar, the candidate nomination period (by party or labor congress or signature collection) ended on August 1. Candidate registration will be determined by district election commissions between August 2 and 11. In recent weeks, “Human Rights Defenders for Free Elections” continued to publish weekly observation reports (July 11-17, July 18-24) noting the use of the “administrative resource” both for signature collection and the promotion of certain candidates’ in state media. On July 30, the human rights observers released a report on the formation of PECs, which concluded executive committees had a “discriminatory approach” toward representatives of opposition parties. Meanwhile, “Belarusian Association of Journalists” (BAJ) published a report analysing how elections are covered by 18 Belarusian non-state and state-run media. Their analysis reveals that the state-run online media outlets “gave much less prominence to the forthcoming election than subjects such as sports or weather.” For instance, the news show on ONT channel allocated 1.8 percent of airtime to cover the elections, while 20 percent was allocated for sports. Democratic political activists reported various incidents that occurred during signature collection. For example, an unknown person threatened members of the initiative group of BPF contender Natalya Iljinich in Mariana Horka. “Tell the Truth” candidate Pavel Kurskiy filed a complaint because he was not allowed to collect signatures in two dormitories in Minsk. BCD contender Marina Homich also filed a complaint claiming that district commission members prevented her initiative group from collecting signatures. “For Freedom” activists reported the police officers tried to disrupt signature collection for their Deputy Chair Yuri Gubarevich near the “Belteleradiocompany” territory, and an unknown person also cut a white-red-white flag at Gubarevich’s picket.